Terrain: Almost entirely flat desert plain (highest elevation point — 306 m). Climate: Summers are intensely hot and dry with average highs ranging from 42o-49oC (108o-120oF); winters are short (Dec.-Feb.) and cool, averaging 10o-30oC (50o-80oF), with limited rain. Nationality: Noun and adjective — Kuwaiti(s). Population (PACI 2011. ): 3,632,009 including approximately 1.16 million Kuwaiti citizens, 2.47 million non-Kuwaiti nationals, and 100,000 stateless persons. Annual population growth rate (2011 est. ): 2%. Ethnic groups: Kuwaiti 32%, other Arab 27%, South Asian 37%, other 4%. Religion: Muslim estimated 85% (Sunni 70%, Shi'a 30% among Kuwaitis), with sizable Hindu, Christian, and Buddhist communities. Education: Compulsory from ages 6-14; free at all levels for Kuwaitis, including higher education. Adult literacy (age 15 and over) — 93.3% for the total population (male 94.4%, female 91%) (2009 ). Health: Infant mortality rate (2009 est.) — 8.97 deaths/1,000 live births. Life expectancy (2009 est.) — 76.51 yrs. male, 78.96 yrs. female. Work force (2009 est. ): 2.091 million (75% male, 25% female; 20% Kuwaiti citizens). Branches: Executive: Amir (head of state); prime minister (head of government); Council of Ministers (cabinet) is appointed by prime minister and approved by the Amir. Legislative — unicameral National Assembly (Majlis al-'Umma) of 50 elected members who serve 4-year terms plus all ministers, who serve as ex officio members. Judicial — High Court of Appeal. Political parties: None; formal political parties have no legal status, although de facto political blocs exist. Elections: There are no executive branch elections; the Amir is hereditary; prime minister and crown prince are appointed by the Amir. National Assembly elections will be held on February 2, 2012. 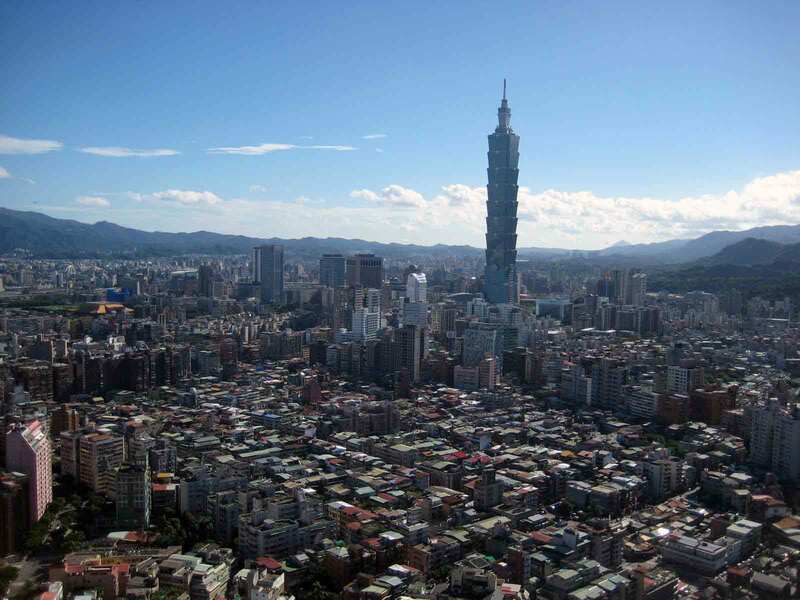 Municipal council elections were held on June 25, 2009. Suffrage: Adult males and since May 16, 2005, adult females who are 21, have been citizens for 20 years, and are not in the security forces. In June 2006, women participated as voters and candidates in parliamentary elections for the first time. GDP (official exchange rate, 2011 est. ): $130 billion. Real GDP growth rate (2010 est. ): 4.4%. Agriculture & fishing (about 8.02% of GDP): With the exception of fish, most food is imported. Cultivated land — 1%. Services (about 30% of GDP): public administration, finance, real estate, trade, hotels, and restaurants. Trade (2010 est. ): Exports: $65.98 billion f.o.b. : oil (93%). Major markets — Japan 17%, South Korea 18.8%, India 15.1%, U.S. 7.6%, Singapore 8.1%, China 12.9%, Taiwan 11.9%. Imports — $19.4 billion f.o.b. : food, construction materials, vehicles and parts, clothing. Major suppliers — U.S. 10.8%, Japan 7.2%, Germany 7.6%, China 12%, Saudi Arabia 5.9%, Italy 4.4%, U.K. 3.2%, India 5.4%, UAE 4.2%, South Korea 4.2% (2009). Over 90% of the population lives within a 500-square kilometer area surrounding Kuwait City and its harbor. Although the majority of people residing in the State of Kuwait are of Arab origin, fewer than half are originally from the Arabian Peninsula. The discovery of oil in 1938 drew many Arabs from nearby states. Following the liberation of Kuwait from Iraqi occupation in 1991, the Kuwaiti Government undertook a serious effort to reduce the expatriate population by specifically limiting the entry of workers from nations whose leaders had supported Iraq during the Gulf War. Kuwait later abandoned this policy, and it currently has a sizable foreign labor force (approximately 68% of the total population is non-Kuwaiti). Of the country's total population of 3.5 million, approximately 85% are Muslims, including nearly all of its 1.06 million citizens. While the national census does not distinguish between Sunni and Shi'a adherents, approximately 70%-75% of citizens, including the ruling family, belong to the Sunni branch of Islam. The remaining 25-30% of Kuwaiti citizens are Shi'a, with the exception of about 100-200 Christians and a few Baha'is, are Shi'a. Among expatriates, there are an estimated 450,000 Christians, 300,000 Hindus, 100,000 Buddhists, 10,000 Sikhs, and 400 Bahai. Kuwait's 93.3% literacy rate, one of the Arab world's highest, is the result of extensive government support for the education system. Public school education, including Kuwait University, is free, but access is restricted for foreign residents. The government sponsors the foreign study of qualified students abroad for degrees not offered at Kuwait University. In 2009, approximately 3,318 Kuwaitis were enrolled in U.S. universities. Threatened in the 19th century by the Ottoman Turks and various powerful Arabian Peninsula groups, Kuwait sought the same treaty relationship Britain had already signed with the Trucial States (U.A.E.) and Bahrain. In January 1899, the ruler Sheikh Mubarak Al Sabah — "the Great" — signed an agreement with the British Government that pledged himself and his successors neither to cede any territory, nor to receive agents or representatives of any foreign power without the British Government's consent, in exchange for protection and an annual subsidy. When Mubarak died in 1915, the population of Kuwait of about 35,000 was heavily dependent on shipbuilding (using wood imported from India) and pearl diving. Following liberation, the UN, under Security Council Resolution 687, demarcated the Iraq-Kuwait boundary on the basis of the 1932 and 1963 agreements between the two states. In November 1994, Iraq formally accepted the UN-demarcated border with Kuwait, which had been further spelled out in UN Security Council Resolutions 773 and 883. Despite these steps, bilateral relations between Kuwait and Iraq continued to be troubled into 2010 by unresolved problems related to border demarcation, debt, reparations, and the return of missing persons and archives seized during the 1990 invasion. Kuwait is a constitutional, hereditary emirate ruled by princes (Amirs) who have been drawn from the Al Sabah family since the middle of the 18th century. The 1962 constitution provides for an elected National Assembly and details the powers of the branches of government and the rights of citizens. Under the Constitution, the National Assembly has a limited role in approving the Amir's choice of the Crown Prince, who succeeds the Amir upon his death. If the National Assembly rejects his nominee, the Amir then submits three names of qualified candidates from among the direct descendants of Mubarak the Great, the founder of modern Kuwait, from which the Assembly must choose the new Crown Prince. Successions have been orderly since independence. In January 2006, the National Assembly played a symbolically important role in the succession process, which was seen as an assertion of parliament's constitutional powers. For almost 40 years, the Amir appointed the Crown Prince as Kuwait's Prime Minister. However, in July 2003, the Amir formally separated the two positions and appointed a different ruling family member as Prime Minister. 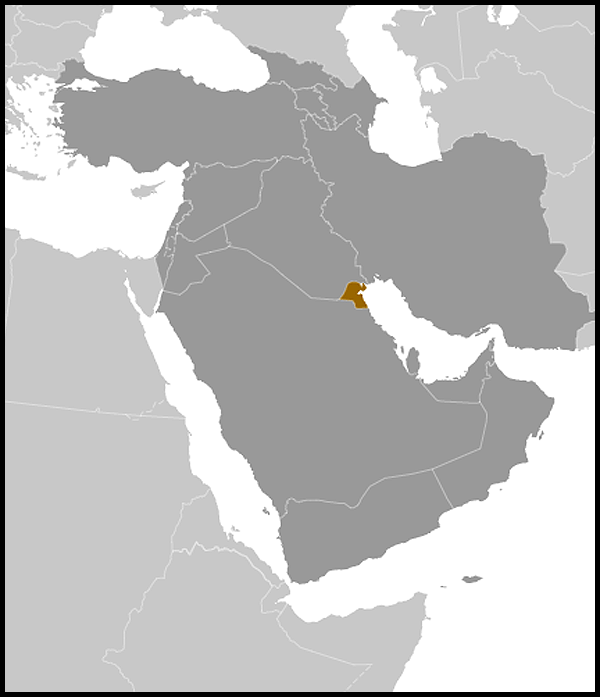 Kuwait's first National Assembly was elected in 1963, with follow-on elections held in 1967, 1971, and 1975. From 1976 to 1981, the National Assembly was suspended. Following elections in 1981 and 1985, the National Assembly was again dissolved. Fulfilling a promise made during the period of Iraqi occupation, the Amir held new elections for the National Assembly in 1992. In 1999, 2006, 2008, March 2009, and December 2011, the Amir dissolved the National Assembly, but complied with the constitution by holding new elections within 60 days. The upcoming general election, to be held in February 2011, is expected to be considered free and fair. Women will participate for the fourth time as voters and candidates. The February 2012 parliamentary election will be the third under a new five-constituency system. The government does not officially recognize political parties; however, de facto political blocs, typically organized along ideological lines, exist and are active in the National Assembly. Although the Amir maintains the final word on most government policies, the National Assembly plays a real role in decision-making, with powers to initiate legislation, interpellate ("grill") cabinet ministers, and conduct a vote of no-confidence for individual ministers. For example, in May 1999, the Amir issued several landmark decrees dealing with women's suffrage, economic liberalization, and nationality. The National Assembly later rejected all of these decrees as a matter of principle and then reintroduced most of them as parliamentary legislation. In July 2005, the Prime Minister appointed Kuwait's first female minister, Masouma Al-Mubarak, as Planning Minister and Minister of State for Administrative Development Affairs, and later as Minister of Health. Dr. Amani Khalid Buresli, appointed Minister of Commerce in December 2011, is the sole female cabinet member. Kuwait is a geographically small but wealthy country with a relatively open economy and self-reported crude oil reserves of nearly 105 billion barrels — approximately 8% of world reserves. Petroleum accounts for nearly half of GDP, 95% of export revenues, and 95% of government income. Kuwaiti officials have committed to increasing oil production to 4 million barrels per day (bpd) by 2020. Due to a budget surplus generated from oil prices, Kuwait survived the economic crisis that began in 2008, and in 2010 it posted its twelfth consecutive budget surplus. Kuwait has done little to diversify and reform its economy, in part because of this positive fiscal situation, but also due to the poor business climate. In addition, the acrimonious relationship between the National Assembly and the executive branch has stymied most movement on economic reforms. Nonetheless, in 2010 the government passed an economic development plan that pledged to spend up to $104 billion over 5 years to diversify the economy away from oil, attract more investment, and boost private sector participation in the economy. There is speculation whether such an increase in spending over the planned time frame is even possible. The Kuwait National Assembly passed a law on December 26, 2007, amending the Income Tax Decree No. 3 of 1955 and setting the foreign corporate tax rate at a flat 15% to attract more foreign investment. The foreign corporate tax rate previously ranged from 0% to 55%. In 1934, the ruler of Kuwait granted an oil concession to the Kuwait Oil Company (KOC), jointly owned by the British Petroleum Company and the Gulf Oil Corporation. In 1976, the Kuwaiti Government nationalized KOC. The following year, Kuwait took over part of onshore production in the Divided Zone between Kuwait and Saudi Arabia. Kuwait Gulf Oil Company (KGOC) produces jointly there with Saudi Arabian Chevron, which, by its 1984 purchase of Getty Oil Company, acquired the Saudi Arabian onshore concession in the Divided Zone. Saudi Arabia renewed Chevron's concession in the Divided Zone for another 30 years, effective from February 2009. KGOC also manages offshore production operations, while Aramco Gulf Oil Company (AGOC) manages the Saudi portion of the offshore Divided Zone. Kuwait Petroleum Corporation (KPC), an integrated, state-owned oil company, is the parent company of the government's operating companies in the petroleum sector. It includes Kuwait Oil Company, which produces oil and gas; Kuwait National Petroleum Company, which manages refining and domestic sales; Petrochemical Industries Company, which produces ammonia, urea, ethylene, propylene, and styrene and participates in a number of successful joint ventures with Dow Chemical within Kuwait and abroad; Kuwait Foreign Petroleum Exploration Company, which is responsible for exploration and upstream production outside Kuwait (in several developing countries and Australia); Kuwait Oil Tanker Company; Kuwait Gulf Oil Company, responsible for exploration and production in the Kuwait portions of the offshore and onshore Divided Zone; and Kuwait Petroleum International, which manages refining and retail operations outside Kuwait (in Europe and East Asia). According to official Organization of Petroleum Exporting Countries (OPEC) figures, Kuwait has approximately 101.5 billion barrels of proven oil reserves (including the Kuwaiti share of proven reserves in the Divided Zone), the fifth-largest oil reserves in the world after Saudi Arabia, Canada, Iran, and Iraq. By 1993, Kuwait had restored its oil production capacity to its pre-occupation levels of 2.4 million bpd. Kuwait's current oil production capacity is estimated at 3 million bpd. Kuwait plans to increase its capacity to 3.5 million bpd by 2015 and 4.0 million bpd by 2020. Many analysts question whether these goals are feasible. Kuwaiti export crude averaged $82 per barrel in 2010. KPC purchased refineries in the Netherlands and Italy and service stations in the Benelux nations, Italy, and Scandinavia from Gulf Oil Company. In 1987, KPC bought a 19% share in British Petroleum, which was later reduced to 10%. KPC markets its products in Europe under the brand name Q8. In 2006, KPC announced plans to participate in a joint venture to build and operate a refinery and associated petrochemical plant in China. In April 2008, KPC signed a joint venture agreement with Idemitsu Kosan-Japan to hold a 35.1% stake, worth $6 billion, of Vietnam's second refinery. Both projects are pending processing of domestic licenses. In 2008, KPC awarded a $14 billion project to construct a fourth refinery to several international firms. The project would increase refining capacity from the current 930,000 barrels per day to 1.5 million barrels per day by 2012. However, this project was canceled in March 2009. Under political pressure, the tendering process was reviewed and found illegitimate, as it was not awarded under the Central Tenders Committee bidding process. As of now, the fourth refinery has not been retendered. The government has sponsored many social welfare, public works, and development plans financed with oil and investment revenues. Among the benefits for Kuwaiti citizens are retirement income, marriage bonuses, housing loans, virtually guaranteed employment, free medical services, and education at all levels. By Amiri decree, the government occasionally disburses a portion of its budget surplus as a grant to all Kuwaiti citizens. In 2006, an Amiri grant of 200 Kuwaiti dinars (approximately $700) was paid to every citizen who applied. In 2007, the government implemented a debt forgiveness scheme for Kuwaiti citizens amounting to just over $1 billion. In February 2011, the government announced an Amiri grant of estimated 1.5 billion Kuwaiti dinars (approximately $5.3 billion), including 1,000 Kuwaiti dinars (approximately $3,500) to be paid to every citizen along with free monthly food baskets to each Kuwaiti family for 14 months. Foreign nationals residing in Kuwait do not have access to these welfare services. The right to own stock in publicly traded companies, real estate, and banks or a majority interest in a business is limited to Kuwaiti citizens and citizens of Gulf Cooperation Council (GCC) countries under limited circumstances. Industry in Kuwait consists of several large export-oriented petrochemical units, oil refineries, and a range of small manufacturers. It also includes large water desalinization, ammonia, desulphurization, fertilizer, brick, block, and cement plants. The U.S. and Kuwaiti governments signed a Trade and Investment Framework (TIFA) agreement in 2004, providing a forum to address mutual trade concerns and needed economic reforms. Kuwait and the other GCC nations signed a free trade agreement with Singapore in 2008, and with the European Free Trade Association (EFTA) in 2009. Kuwait does not attract significant foreign direct investment (FDI), largely due to bureaucratic obstacles and barriers to doing business in Kuwait. Agriculture is limited by the lack of water and arable land. The government has experimented in growing food through hydroponics and carefully managed farms. However, much of the soil which was suitable for farming in south central Kuwait was destroyed when Iraqi troops set fire to oil wells in the area and created vast "oil lakes." Fish and shrimp are plentiful in territorial waters, and large-scale commercial fishing has been undertaken locally and in the Indian Ocean. The Kuwait Oil Tanker Company has 24 crude oil, liquefied petroleum gas, and refined product carriers and is the largest tanker company in an OPEC country. Kuwait is a member of the United Arab Shipping Company. The Kuwaiti dinar is currently pegged to an undisclosed basket of currencies. 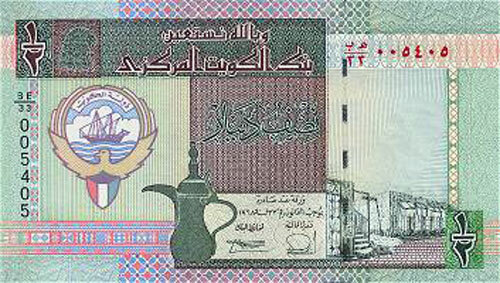 As of December 1, 2011, one U.S. dollar was equivalent to 0.2749 Kuwaiti dinars. Soaring oil prices in 2010 contributed to a budget surplus for fiscal year 2010/11 (ending March 31, 2011). As of November 2011, the budget surplus was estimated at $29.9 billion for the first 7 months of the 2011-2012 fiscal year. The Kuwait Investment Authority's (KIA) Kuwait Sovereign Wealth Fund manages the Kuwait General Reserve Fund and the Kuwait Future Generations Fund. KIA is prohibited by law from publicly discussing the size of its holdings, and avoids any but the most general discussions of asset allocation. KIA does, however, provide closed-door presentations on the full details of all funds under its management — including its strategic asset allocation, benchmarks, and rates of return — to the Council of Ministers as well as to the National Assembly. Media reports in 2011 speculated that KIA's holdings were approximately U.S. $250 billion. Kuwait has been a major source of foreign economic assistance to other states through its Kuwait Fund for Arab Economic Development (KFAED). The fund is an autonomous state institution created in 1961 on the pattern of western and international development agencies and is chaired by the Kuwaiti Foreign Minister. In 1974, the fund's lending mandate was expanded to include all non-Arab developing countries. According to the most recent statistics, the fund's paid capital amount is $7 billion. The fund has granted 805 loans with a total value of about $15.6 billion since its inception, and has extended technical assistance on 102 countries, including 16 Arab countries, 40 African countries, 35 Asian and European countries, and 11 Latin American countries. During 2011, , the fund signed 15 loan agreements, valued at $316.27 million, with four Arab countries, five African countries, three countries in East Asia, South Asia, and the Pacific, two countries in Central Asia and Europe, and one country in Latin America and the Caribbean region. The Government of Kuwait has abandoned its previous policy of limiting the entry of workers from nations whose leaders had supported Iraq during the Gulf War. In August 2001, the Interior Minister announced that there were no longer any special restrictions or permits required for Palestinian workers wishing to return to the country. At the end of 2009, there were approximately 30,000 Palestinians, 48,000 Jordanians, and 5,000 Yemenis resident in Kuwait. Since liberation from Iraq, Kuwait has made efforts to secure allies throughout the world, particularly UN Security Council members. In addition to the United States, defense arrangements have been concluded with the United Kingdom, Russia, and France. Ties to other key Arab members of the Gulf War coalition — Egypt and Syria — also have been sustained. During the 2002-03 buildup to and execution of Operation Iraqi Freedom (OIF), Kuwait was a vital coalition partner, reserving a full 60% of its total land mass for use by coalition forces and donating significant assistance in kind to the effort. Kuwait continued to provide generous assistance in kind to coalition operations in Iraq. Kuwait has been consistently involved in reconstruction efforts in Iraq, pledging $1.5 billion at the October 2003 international donors' conference in Madrid, and consulting closely with Iraqi officials, including former Prime Minister Ibrahim Jaffari, who visited Kuwait in late October 2005, and Prime Minister Nouri al-Maliki, who visited in July 2006 and again in April 2007. Kuwait has been an active and vocal public supporter of the political process in Iraq, welcoming the January 2005 elections and praising Iraq's October 2005 successful constitutional referendum. In April 2008 Kuwait hosted the Iraq Neighbors' Conference, which was attended by Secretary of State Condoleezza Rice, Iraqi Prime Minister Nouri Al-Maliki, and foreign ministers from throughout the region. In October 2008, Lieutenant General (retired) Ali Al-Mou'min presented his credentials as Kuwait's Ambassador to Baghdad to Iraqi President Jalal Talabani. Two years later, in 2010, Iraq nominated Muhammad Al-Ulum to become the first Iraqi Ambassador to Kuwait since 1990. The U.S.-Kuwaiti strategic partnership intensified dramatically again after Iraq's invasion of Kuwait. The United States spearheaded UN Security Council demands that Iraq withdraw from Kuwait and its authorization of the use of force, if necessary, to remove Iraqi forces from the occupied country. The United States also played a dominant role in the development of the multinational military operations Desert Shield and Desert Storm that liberated Kuwait. The U.S.-Kuwaiti relationship has remained strong in the post-Gulf War period. Kuwait and the United States worked on a daily basis to monitor and to enforce Iraq's compliance with UN Security Council resolutions; from 2003, Kuwait also provided the main platform for Operation Iraqi Freedom. Kuwait likewise played a key role in facilitating the withdrawal of U.S. combat troops and associated equipment from Iraq, which concluded in December 2011. Since Kuwait's liberation, the United States has provided military and defense technical assistance to Kuwait from both foreign military sales (FMS) and commercial sources. The U.S. Office of Military Cooperation in Kuwait (OMC-K) is an integral part of the American embassy and manages the FMS program. OMC-K is a joint unit consisting of representatives from all four U.S. military services and civilians, which serves as a liaison between the Kuwaiti military and U.S. Central Command (and its associated components). OMC-K personnel also assist the Kuwait military with training, education, readiness, and war fighting. There are currently 140 open FMS cases between the U.S. Government and the Kuwaiti Ministry of Defense, totaling over $9.6 billion. Principal U.S. military systems currently purchased by the Kuwaiti Defense Forces are the PATRIOT Missile system, F/A-18 Hornet fighters, M1A2 main battle tanks, AH-64D Apache helicopters, and a major recapitalization of Kuwait's Navy with U.S.-manufactured boats. Kuwaiti attitudes toward American products have been favorable since the Gulf War. In 1993, Kuwait publicly announced abandonment of the secondary and tertiary aspects of the Arab boycott of Israel (those aspects affecting U.S. firms). The United States is currently Kuwait's largest supplier of goods and services, and Kuwait is the fifth-largest market in the Middle East. U.S. exports to Kuwait totaled $2.14 billion in 2006. Provided their prices are reasonable, U.S. firms have a competitive advantage in many areas requiring advanced technology, such as oil field equipment and services, electric power generation and distribution equipment, telecommunications gear, consumer goods, and military equipment. Kuwait also is an important partner in U.S. counterterrorism efforts, providing assistance in the military, diplomatic, and intelligence arenas and also supporting efforts to block financing of terrorist groups. 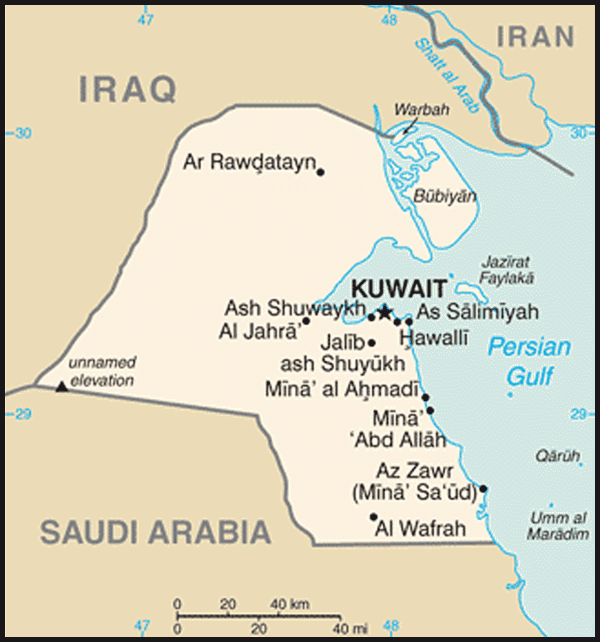 In January 2005, Kuwait Security Services forces engaged in gun battles with local extremists, resulting in fatalities on both sides in the first such incident in Kuwait's history. In January 2008, three Kuwait citizens were designated by the UN 1267 Committee as terrorist facilitators and in May 2008, in compliance with UN 1267 obligations, the Government of Kuwait froze the assets of the three Kuwaitis. The U.S. Embassy (http://kuwait.usembassy.gov/) in Kuwait is located at Al Masjed Al Aqsa Street. Block 13, Bayan Plan 36302. The mailing address is P.O. Box 77, SAFAT, 13001 Safat, Kuwait; or PSC 1280 APO AE 09880.